The North Fork River is ranked in the Top 100 trout streams of the US. Trout Fishing on the North Fork River is open ALL YEAR, and our lodges or cabins are relaxing and cozy no matter what the weather is like. While trout are not native to Missouri, Rainbow trout were introduced in Missouri waters in 1882 and are restricted to a few areas of the Ozarks. The North Fork of the White River not only sustains trout, but is one of the few waters in the Ozarks that supports a naturally reproducing population of wild Rainbow trout. 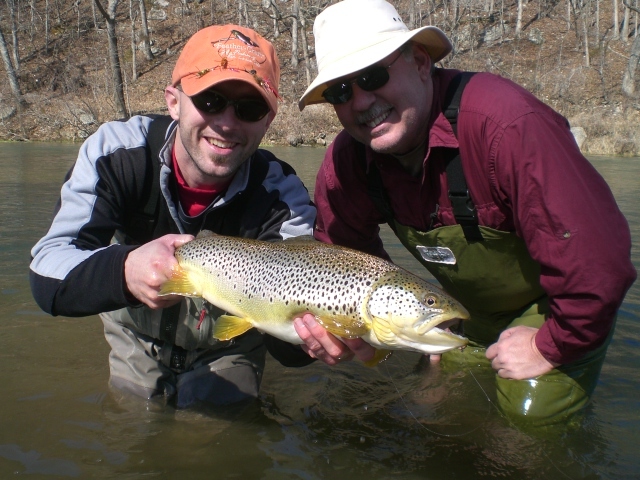 Fly fishing enthusiasts from all over not only enjoy the fishing, but also the landscape. The prime conditions of the North Fork River also produce trophy size trout, of both Rainbow and annually stocked Brown trout. The North Fork River has both Wild Trout and Special Trout Management areas (formerly the Championship Trout Management Area). The North Fork is a limestone bottomed river, fed by multiple cold springs. Because it's somewhat off the beaten path of other Ozark rivers, the North Fork may be sometimes enjoyed in complete serenity. The North Fork River can be divided into 3 differing sections. The upper part of the river sports excellent Smallmouth, Sunfish, and Rock Bass (Goggle-eye) fishing. This area starts at the source, within the Mark Twain National Forest, and goes to Rainbow Springs where the habitat of the river changes. The upper section of the North Fork is located predominately in the Devil's Backbone region of Mark Twain National Forest and features warmer water than the rest of the North Fork. This area has several public access points including Topaz, Hebron, and Twin Bridges. Fish are commonly taken by fly fishing and spin fishing. When you come around a bend in the river and the size of the North Fork suddenly doubles, you are almost at Rainbow Springs. Stick your hand in the water and see how much colder it is. Guided Missouri Trout Fishing Trips in Missouri's 3rd largest spring. 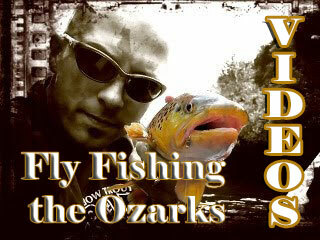 Plan your Missouri guided fly fishing trip now in Missouri's 3rd largest spring right here in the Ozarks. This 3/4 miles spring fed lagoon is the perfect place for your next trout fishing adventure. 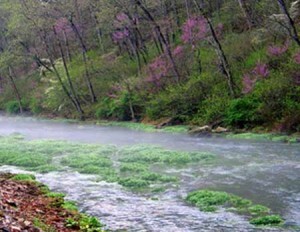 Between Rainbow Springs and Blair Bridge is the Missouri Wild Trout Management Area of the North Fork River. This area has not been stocked with Rainbow trout since 1964 and features excellent fly fishing for wild rainbow trout . In 1995 the stocking of Brown trout was stopped in this 5.9 mile stretch of the river designated as Wild Trout area. This lack of habitat competition, along with the protective regulations, have allowed the Rainbow trout population to steadily improve in both size and amounts. Many huge Brown trout wander upstream from the Special Trout Management Area and may also be caught in the Wild Trout Area. While 80% of the trout in this area are native rainbows, when it comes to trout over 18" in length about 80% are Brown trout. Because most of this portion of the North Fork is privately owned, the best method to fish the Wild Trout Area is by canoe, or as a guest of the River of Life Farm. 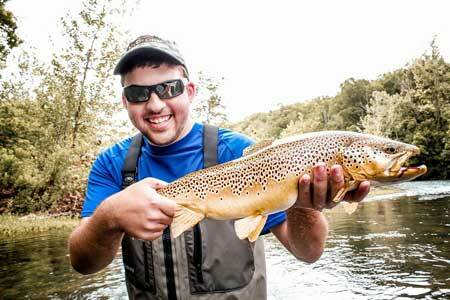 For catching wild trout, the North Fork is a true gem of the Ozarks. Special trout fishing regulations apply within the Wild Trout Management Area. These regulations include a limit of one trout per day, that must measure 18" or greater. This one trout limit is for either a Rainbow or Brown trout, not both. Only flies and artificial lures may be used. Soft plastic baits, natural and scented baits are specifically prohibited. These strict harvest regulations ensure there are quality trout for everyone! Our guests have exclusive entry to over one mile of private river bank for wade fishing access. And all this within the Missouri Wild Trout Management Area. What a setting for an awesome fly fishing experience! Fly fishing is the norm for success in this section of the North Fork River. Dry flies and nymphs fished in the current seams and drop-offs are local favorites. A trout stamp is required for harvesting a trout anywhere in the state of Missouri. From Blair Bridge to where the North Fork River becomes Lake Norfork, is designated as a Missouri Special Trout Management Area. This area features championship wild rainbows and huge Brown trout. Yearly, the Missouri Dept. 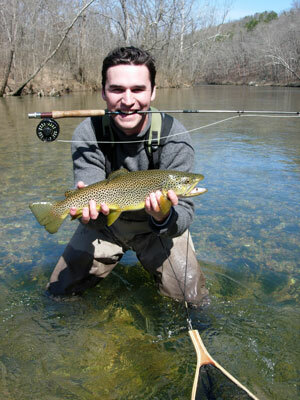 of Conservation stocks thousands of Brown trout per mile in the Special waters between Blair bridge and Norfork Lake. Once again special regulations apply. The daily limit is three trout, which must measure 15 inches or longer. Artificial and natural baits are allowed. Explore the North Fork River with a Guide, by Canoe, or wade the "Miracle Mile" of Wild Trout Management Area... an exclusive for River of Life Farm guests.